This is a genuine Sharp Corporation SCSI board. It is SCSI1 compliant and is the most reliable because it is genuine. 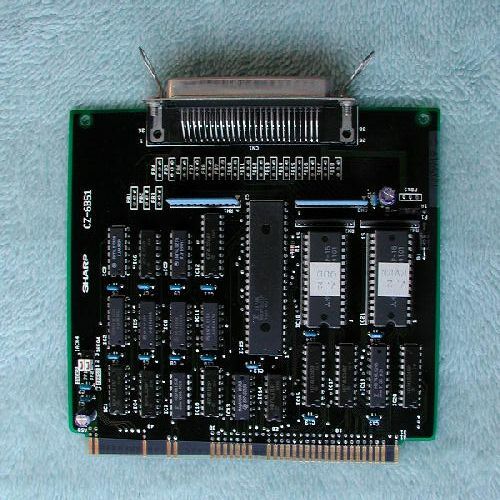 This board is made for X68000 personal workstation series (except CZ-623) and is attached to I/0 expansion slot. It can be used with SCSI MO drives, hard disks or CD-ROM/RW units. Small Computer System Interface (SCSI) is the standard for data exchange between computer systems and peripherals. 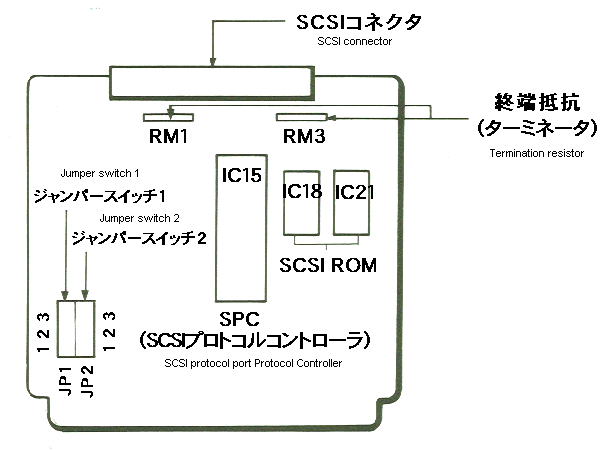 Mass Storage Device with SCSI interface: up to seven devices can be connected in daisy-chain. Data transfer rate is faster than for SASI interface. Please keep packaging materials in safe place. When installing SCSI bracket pay attention to which one you need, because desktop models such as CZ-652C, CZ-653C, CZ-662C, CZ-663C have different dimensions. Switch the power switch to “Off” position, unplug the power cord and proceed with the installation. Use this device only after installing the bracket and reading the instruction manual which came with your SCSI device. When not in use for long periods of time, remove the device from computer and put it into the supplied anti-static bag to protect it from electro static discharge. If the device has stopped working, please contact the nearest customer service center. 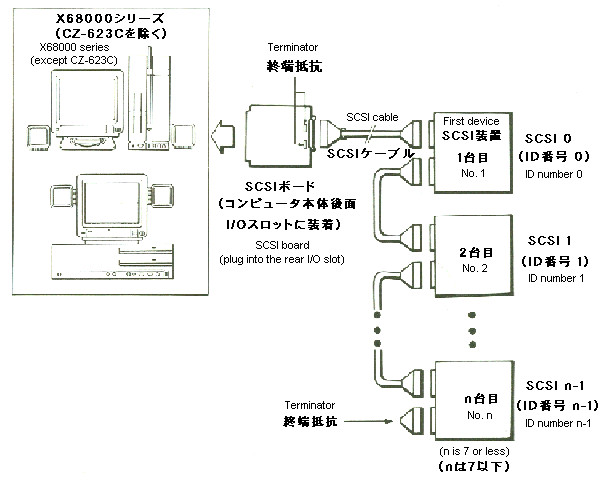 The SCSI interface and X68000 integrated SASI interface, except for the CZ-623C, is different and SCSI interface is seen by Human68k as another interface that can interchange data betwean both interfaces. Devices which are connected to SASI interface and those which are connected to SCSI have different representation ID's. For example, SASI (HD0 - HD15) and SCSI (SCSI0 - SCSI7). Device may be marked with ID that it represents. ID numbers for SCSI and SASI devices differ and they are physically different interfaces. As described above, SASI can handle up to 16 devices, SCSI can handle up to a maximum of 7 devices. A maximum of 23 devices can be connected in total. 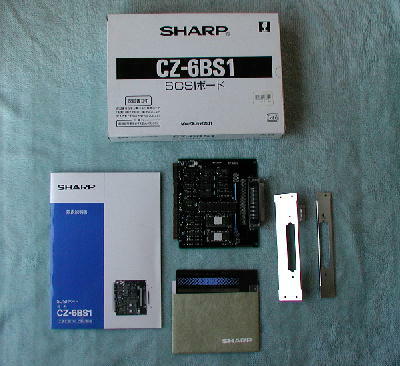 This board was used without problems even after connecting the same amount of devices to SCSI and SASI interface at the same time. Jumpers JP1, JP2 set the interrupt priority for 68000 CPU to level 2 or 4 (Source I/0 is available in two levels) and the board interprets from the jumper settings which one to use. Factory default is set to level 2. If you own the software, interrupt handling is set as follows. Set the priority level of the interrupt request signal with jumper JP2, set the interrupt priority level of the allowed signal with jumper JP1. The priority level can be selected as Level 2 or Level 4. Kernel-level priority interrupt request signal will be activated and allowed signal will be set to the same level. Both jumpers must be set at the same level. When used in tower models such as CZ-600C, CZ-601C, CZ611C, CZ-602C, CZ-612C, CZ-603C, CZ-613C the device must be installed in I/0 slot 2. If you are planing to use the CZ-6BS1 in conjunction with CZ-6BE2, CZ-6BE4, CZ-6BF1, CZ-6BM1, CZ-6BP1, CZ-6BC1, please populate I/O slot 1 before installing this board. This board can also be used in conjunction with CZ-6BG1, CZ-6BU1, CZ-6BL1, CZ-6BL2, CZ-6BN1 boards. For desktop models such as CZ-652C, CZ-653C, CZ-662C, CZ-663C please install the device in I/O slot 4. Since the introduction of I/O expansion box (CZ-6EB1) we ship two brackets. Please use the appropriate. However the bracket can not be used in CZ-600C, CZ-601C, CZ-611C, CZ-602C, CZ-612C, CZ-603C, CZ-613C alongside with CZ-6BF1, CZ-6BM1, CZ-6BC1 when combined with this board.